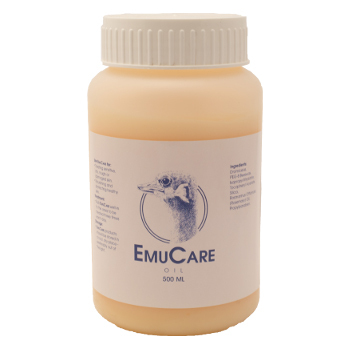 EmuCare has a range of therapeutic skin care products based on emu oil. 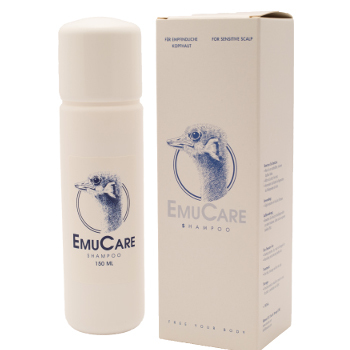 Emu oil has been produced out of the fat of an emu, a walking bird from Australia. This oil contains a high concentration of Omega-3 and Omega-6 unsaturated fatty acids. These fatty acids are important for our body and play an important role with the construction of new skin cells and they are anti-inflammatory. The emu (Dromaeus novaehollandiaeis) is a three-toe bird which lives in Australia and Tasmania. The oil has been gained from a fat hump on the back of the bird. The fat will be rendered and refined carefully. About 100 kilo fat will finally be processed to a 50-90 kilo light yellow oil. The oil, which is a by-product, has very specific properties. The major part of emu oil is oleic acid (± 40%) which acts as a carrier to penetrate the active ingredients deeply into the skin layers. Besides that the unsaturated fatty acids contain an considerable amount of linoleic and alpha linoleic acid, the so-called essential fatty acids. These fatty acids are not being produced by the human body itself, but play an important role by the regeneration of new skin cells. Would you like to find out if EmuCare solves your skin problem? 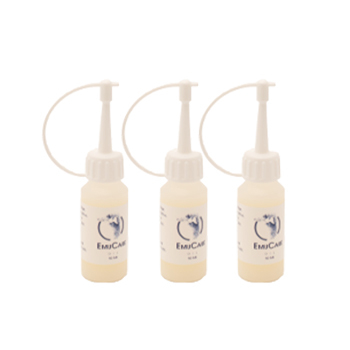 Just to try EmuCare we have the EmuCare Oil mini-flacon 10 ml. You only pay for transport costs (€ 5) and within 3 – 6 days you will know if EmuCare is the solution for your skin problems. Do you want to know what our think of EmuCare? On the independent review site Kiyoh, EmuCare users can share their experiences with the use of our products. Below are the most recent user reviews.